Curious which Venice Airport is yours...? Save your self Time and Prepare which Transfer to Take. Are you booking a flight to Venice Italy...? Did you realize there are 2 Venice Airport? What do you do? Which airport is yours? And how do you get to the Venice lagoon? Read about it, and I will show the airports Venice is using. 'Marco Polo Airport' is located at Tessera, 8 km (5 miles) north of the city. It is on the edge of the Venice lagoon, so arrivals and departures are scenic affairs. Note that you need to have a seat on the right side of the plane when you're going to land... You will have a great view of Venice! Many European airlines serve this airport including British Airways and low-cost Easyjet. The flight duration to Marco Polo Airport is approximately 2 hours from London. From New York, it is non-stop for almost 8 hours. Make sure you buy a bottle of water at the airport. Because Venice seems nearby, but on an Allilaguna boat or a water taxi it still can take long. When it is busy with tourist, there will be a waiting line for using the boats. And you can not buy a drink until you reach Venice. And on a sweltering day, it is necessary that you drink enough. Your journey to Venice lasts almost 1 hour. Treviso airport is a smaller airport and mostly used for budget European airline flights. Ryanair flies into Treviso airport from the UK. Because I prepared our trip very well I knew we would arrive at the smaller airport 'Treviso'. An airport 26 miles from the Venice historical center. 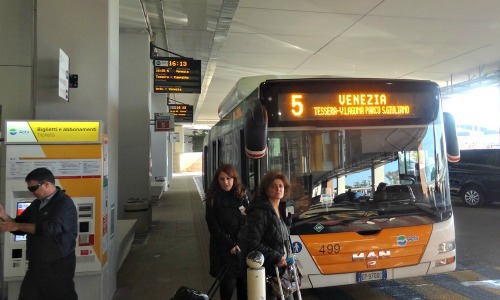 From this airport there is a special bus service which is transporting passengers to and from Venice. This service is a cheap way to reach your destination. Curious how we arrived in Venice? And need more information about the bus services? Check my page about Treviso Airport. From these nearby airports, you can rent a car which is getting you to Venice in Italy. Be independent and have more freedom to transport yourself. Already tired of your flight? Is it getting late? Or only one day visit to Venice? Don´t worry there are enough airport hotels nearby. An airport hotel can be much cheaper than a hotel in the lagoon. From your Venice airport hotel, you can discover the Veneto area. 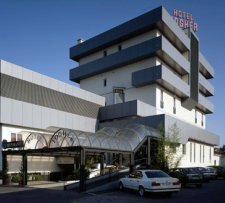 Read here more about the Benefits which Airport Hotels I prefer. Hopefully, now you will know which airport will be yours. Now you can prepare your transfer to Venice. How to get from Venice Italy airport (Marco Polo) to your hotel in Venice? 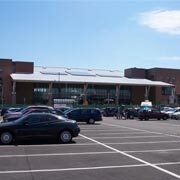 I have for you more in-depth details about how you will get from Treviso Airport and Marco Polo Airport. Read here for more detailed information for Venice Italy Airport. I gave you a good impression about Venice airport. There is enough to explore. Please explore my site and get even more information about the different topics.